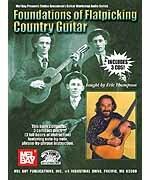 Eric Thompson is a pioneer in the field of flatpicking, first attracting attention over 40 years ago in bluegrass bands with David Grisman and Jerry Garcia. Since then, his big tone and soulful picking have graced a myriad of roots bands, including the Blue Flame Stringband, the California Cajun Orchestra, and the Bluegrass Intentions. In "Foundations of Flatpicking", Eric shares the building blocks for great flatpicking technique. He takes you step-by-step, beginning with song melodies picked out in the bass, with rhythm, in the styles of Maybelle Carter and Charlie Monroe, and moving up to single-note flatpicking, with exercises to help master playing long runs of notes, clean, smooth and fast. Then he builds your repertoire with classic fiddle tunes and breaks to songs, including characteristic devices, phrases and endings from seminal stylists like Don Reno, Doc Watson, and Clarence White. All in standard notation and TAB with three audio CDs included.